There’s a lot to love about Veep’s most recent episode, “Mother,” a series highlight that pretty much sews up Julia Louis-Dreyfus’ fifth consecutive Emmy for Outstanding Lead Actress in a Comedy Series. 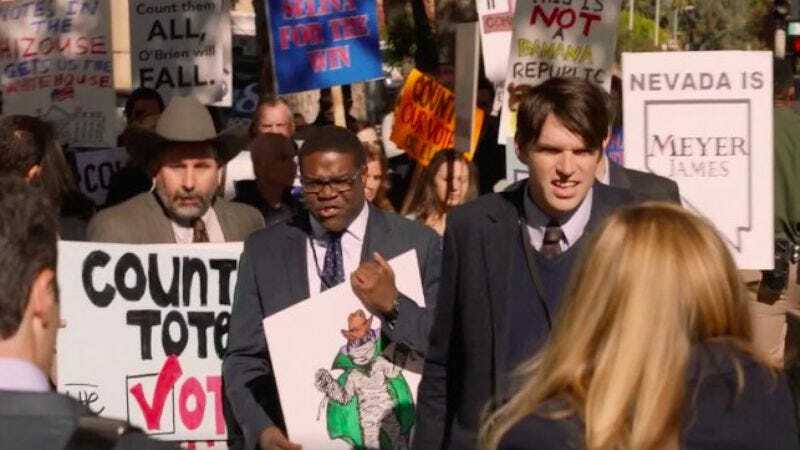 The rat-a-tat pacing, the tragicomedy of President Selina Meyer losing a parent and Nevada, or, for those who might have watched the episode too closely, the inscrutable sign Richard Splett (Sam Richardson) brings to the “count every vote” protest. The image appears to be a mummy in a cowboy hat wearing a green cape. It’s a fantastic visual non sequitur, but what it has to do with a contentious presidential recount is anyone’s guess. Anyone who follows Richardson on Twitter, however, now knows what’s up Count Cowboy Mummy. After The A.V. Club took its sign-based amusement/bafflement online, the Veep co-star and 11 Questions alum came back with an origin story. And it all comes back to intellectual property. Upon closer inspection, it’s easy to make out the purple ears of Count Von Count against the arithmomaniacal Sesame Street resident’s distinctive emerald cloak. And it’s the ideal pop-culture reference for the situation: Tabulating disputed votes would be a dream job for the Count, provided he doesn’t get distracted by all of the other Veep-related items worth indexing. “That’s two, two inventively vulgar metaphors involving the head and the nether regions!” he’d shout from the recount table. And we can imagine him doing so because it’s parody, which isn’t subject to copyright law.